The Tour of The Freedom Trail by the Histrionic Academy is the best way to see Boston. 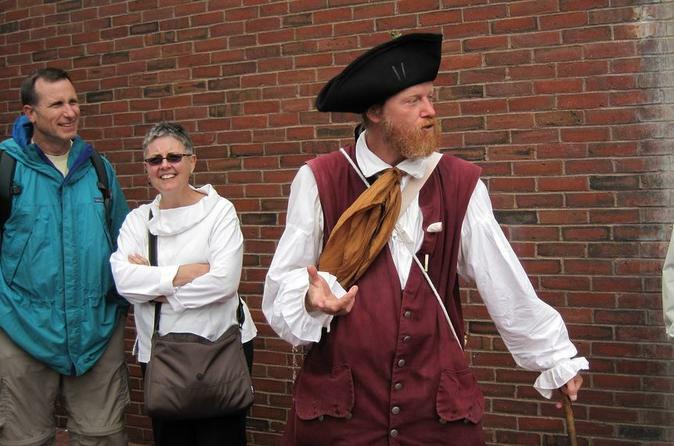 You will meet your costumed guide in the Boston Common and hear about Boston's inspiring history. Following the freedom trail past several historic sites guests will be amazed by the stories of America's Founding Fathers, the American Revolution and New England's Colonial History. This walking tour Follows the Freedom Trail for approximately 1.2 miles from the Boston Common to Faneuil Hall. Check in 15 minutes prior to tour time. For 10:30 and 11:30 tours, the check in will be located at the Boston Common Visitor Center (139 Tremont St.) For all other tours, the check in will be located at the corner of State and Congress St. directly in front of the Bank of America. Tours will leave promptly at their advertised time, so guests must arrive 15 minutes early to check in. The tours follow Boston's famous historical trail. Guests will hear the inspiring stories of the beginnings of the United Sates of America from a real, costumed, and local, historical interpreter. The tour covers the approximate 1.2 miles of the trail between Faneuil Hall and The Boston Common. Tours will take approximately 90 minutes.